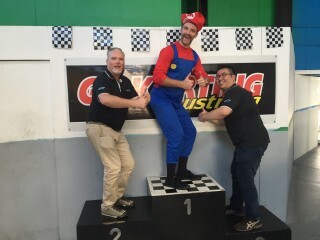 The BE Collective team recently headed over to Slideways Karting for some high-speed bonding and team spirit building. We covered the BE Collective Mission and Vision statements at the event, and those in the know were prepared for our Buzzer Beater Quiz on the BE Collective Team Guide. The winners of the quiz received various prizes including the infamous “IGA Parmy and Chips,” a $50 coffee voucher and a 1 second headstart for the final event: the kart race! All team members performed admirably on the track, however after a controversial banana-peel toss Mario eventually crossed the line first. We finished the day with beers and a barbeque: a day well spent.